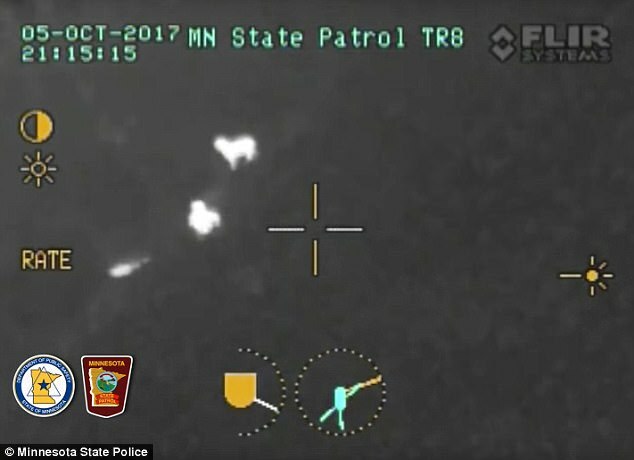 An "adventurous" 2-year-old wandered from his central Minnesota home and was rescued after nightfall, thanks to a State Patrol aircraft's heat-seeking device detecting one of two family dogs that loyally tagged along and remained with the toddler in the dark autumn chill. The boy's few hours with Bella Grace, an English springer spaniel, and her 12-week-old pup, Madeline, came to a tail-wagging happy ending about 9:20 p.m. Thursday in a neighbor's cornfield roughly a quarter-mile away, the boy's grandfather said Tuesday. The toddler "goes with me in the tractor and goes with me to check the corn," said Rick Gertken. "He's adventurous. He's Grandpa's boy." The son of Kaitlyn Bottem was outside the family's home northwest of Richmond playing with three cousins ages 7, 11 and 12, when he strayed about 6:15 p.m., Gertken said. Grandma, who was watching the kids, couldn't locate the boy or the dogs, Gertken said. Authorities were notified after the family's 30-minute search failed to find him and full darkness drew near. Sheriff's deputies were joined in the search by various fire and rescue department personnel, two law enforcement bloodhounds, roughly 200 volunteers and the patrol helicopter, the grandfather said. Searchers "heard the dog barking at one point [before the boy was located], then it stopped barking," said Stearns County Sheriff's Lt. Vic Weiss. 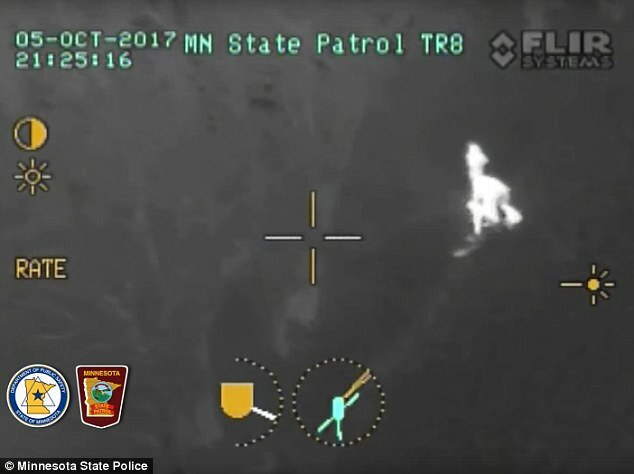 The helicopter picked up "a heat signature" below in a cornfield nearby, which turned out to not only reveal the boy but the family's dog as well, Weiss added. 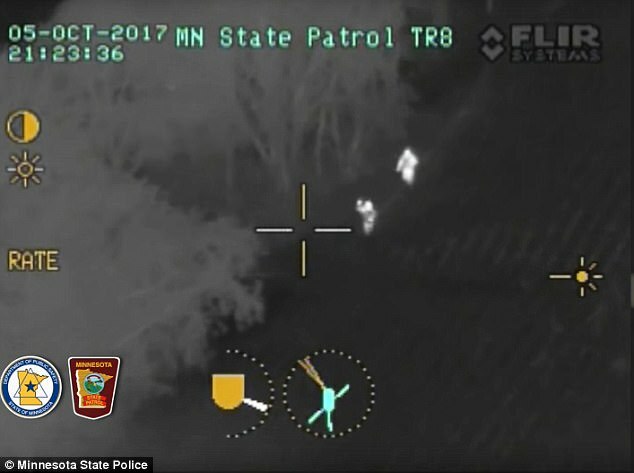 The blurry gray and black imagery from the heat-seeking video shows the older dog walking near the boy and at times sitting down before a sheriff's deputy and a state trooper arrived at the child's side about 9:20 p.m.
What the imagery had more difficulty discerning was puppy Madeline by the boy's side. "The puppy stayed next to the boy the whole time," Gertken said. "The pup's mom backed off." The lieutenant said the Bella Grace's movements near the boy "absolutely, for sure" played a major role in leading searchers to the boy so quickly on an increasingly chilly night. "The [older] dog was in preservation and protection mode," Weiss said. Law enforcement brought "the boy back to his house, where he was reunited with his mother," a Sheriff's Office synopsis read. The child was "in good condition, although a bit cold and hungry." Gertken said the little guy "didn't cry once. He wasn't scared, and that's after being in the dark for three hours."